My sister-in-law shared an interesting recipe for cooking chicken on her blog and I thought it might be fun to try it at home. I did not have fish sauce at home and decided that it was too bothersome to warrant a special trip to the supermarket just for that, so I chose to omit it. Also I tried out this recipe with a toaster-oven instead. 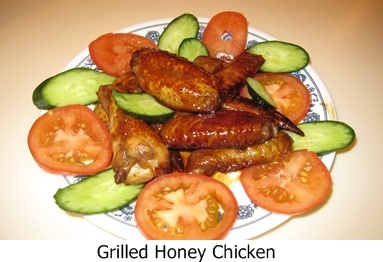 Bearing in mind that children will be part of the dinner group, I took a portion of the chicken wings and prepared Grilled Honey Chicken too. I was not sure if the distinctive taste of lemongrass will go down well with Big Buddy and decided to play it safe. 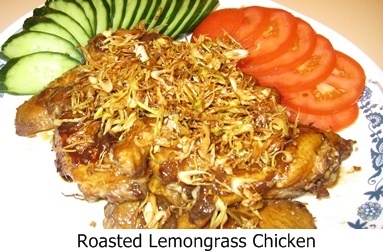 I felt the Roasted Lemongrass Chicken was not fully infused with the aroma of lemongrass. It might have been sufficiently marinaded as I had allowed it to sit for 4 hours before cooking. In future, if I am pressed for time, perhaps I will extract the juice from the lemongrass for marinade instead of using chopped bits. I must say the Grilled Honey Chicken proved to be a bigger hit. All were polished off before I could swipe a piece from the serving plate to taste. 1. Cut chicken wings to separate drumlet and midjoint. 2. Heat a saucepan over medium heat. Add all ingredients for marinade and bring to a boil. Remove from heat, cover saucepan with a lid and leave until completely cool. 3. When marinade is cool, transfer to a mixing bowl. Place chicken in to steep in the marinade. Leave overnight in the refrigerator. 4. Preheat oven at 220 deg C.
5. Arrange chicken thighs on a baking tray. Brush chicken parts with some oil before placing in preheated oven for 12 to 15 minutes. 6. Meanwhile, heat some oil and deep-fry finely sliced lemongrass until crispy and golden brown. Set aside to drain well. 7. Remove chicken from oven and place on a serving plate. Drain drippings from baking tray and serve as a dipping sauce. Add garnish and serve. 2. Combine all the ingredients and marinate for at least 3 hours. 3. Grill chicken in a bread-toaster or oven for 30 min, turning over after 15 min. 4. Remove the chicken and transfer to a plate. 5. Pour the excess marinade and juice from grilling the chicken into a saucepan. Bring to a boil to reduce the quantity. If necessary, add cornstarch mixture to thicken the sauce. 6. Remove the sauce from the heat, pour it over the chicken and serve.